Certikin believes the next twelve months will see a 5% growth in their sales – including inflation. Certikin Managing Director Neil Murray told the first of the series of Certikin Seminars in Taunton that the market had suffered a slow quarter for the last three months of 2010 but although the company was cautious about growth he did expect sales to pick up. 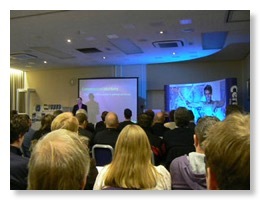 "There are still some strong selling lines out there," he told a packed conference at Taunton’s Holiday Inn. "There are signs the market is coming back. 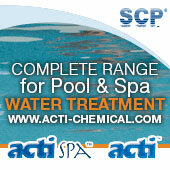 Last year saw a sales growth of 1.3% for us and that’s against a background of it slipping 8% so there is a change." The company is hoping to pull together some more statistics about the overall market in a special survey of delegates to the series of January conferences. "What I am hoping is that we do it every year perhaps changing some of the questions so eventually we can get an idea of where you feel the industry is going." He told delegates that Certikin has a new website being built which would be ready in July. The day saw a number of presentations from the Certikin range. Steve Nelson spoke of the opportunities for the trade in the commercial market. He said the Government’s Spending Review meant massive cuts in key areas involving swimming. He predicted less commercial pools being built with less large refurbishments and more competitive quoting. "There is certain to be more make do and mend," he said. He gave out one statistic showing that of 1,725 pools in the public sector 84.4% were more than 20 years old. In the private sector of hotels, health clubs he expected an increase in expenditure with more hotels being interested in new pools. The preparation for the London Olympics in 2012 would he said generate new business. "It is a mixed bag but there is enough work out there," he added. Jo Catterall profiled the Roldeck pool cover business where Certikin has been a distributor for 25 years and introduced the new Proflex slats made from foam filled solid PVC. 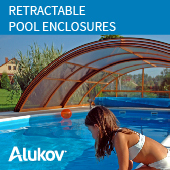 She also announced the launch of a new 2011 above-ground Roldeck Easy Cover for in-ground pools up to 6m x 12m.